It is with great pride and pleasure that we announce the launch of Flipkart’s Billion Capture+ phone which is proudly Powered by tronX. Working in close collaboration with Flipkart, Smartron designers and engineers have delivered a truly world class product ticking every checkbox for excellence in any phone’s list of great core features. Coming in two colours and two different configurations of 3/32GB and 4/64GB, the Billion Capture+ Phone is made to satisfy smartphone feature wish-lists to the 99th percentile. While it is said that the best camera is the one you have with you, we doubled the joy at this price point with a 13M + 13M dual-camera setup. Combined with Smartron developed tronX’s unlimited storage for your full-resolution photos and videos, you can go ahead and amass those memories of yours without you having to worry about those pesky gigabytes. We close the gap between smartphone and DSLRs with the Billion Capture+ that has a stunning portrait mode, and unbelievable low light capabilities. Few smartphone cameras come close at any price point. We live up to our stock Android and no bloatware commitment once more with the Billion Capture+ as well. With this device powered by tronX, we are also working with Flipkart to continue to bring our AI based tronX Launcher to the Billion Capture+ as part of its technology roadmap. Powered by tronX: With Smartron design behind the elegant form and our engineering teams behind the close to 2-day battery life, excellently tuned camera, unlimited backup for your memories, the Billion Capture+ is a killer phone in this price segment. Our Powered by tronX stamp on this smartphone, brings the promise of a strong AI-powered partner ecosystem at your fingertips that is deeply integrated into the operating system. Look forward to exciting updates to this device. Features like its 3500 mAh battery, QuickCharge capable adaptor and 5.5” full-HD screen ensure an overall, pleasurable experience. Under the hood is an octa-core Snapdragon 625, providing you a stutter-free multi-tasking experience. Congrats to your team.... By launching capture+ smartron tronX HAWA started in the realm of wireless world. Wishing you great success... And expecting the next gen SRT phone would be a killer one greater than all. Jai BHARATH. The Camera Billion Capture+ runs on Snapdragon 625 octa-core with a combination of 13-megapixel RGB sensor and a 13-megapixel monochrome sensor(B+M). Together both sensors will ensure photos that are high on quality and details in Lowlight mode with ist SUPER NIGHT mode. The dual-camera setup also allows one to shoot photos like DSLR-Bokeh effects with its PORTRAIT mode. Billion Capture+ shooter with Auto Focus, Face Detection, HDR, Panorama Mode, Geo-tagging, Touch Focus, Digital Zoom, Video Recording. The smartphone also has a Front Facing Camera capable of shooting 8 MP selfies with HDR. Many many congratulations. I have been using smartron.srt phone for last 3 months n m really satisfied with the performance and features. It's high time that you kind of home grown Indian start up be the answer for make in India and made for India. Keep bringing the competitive and pocket friendly devices for the citizens n b the most successful brand in India. Very anxiously excepting an exchange offer for our smartron mobile to grab capture+ phone. Also want to know eagerly, is it wise decision to choose capture+ over smartron phone, considering processer, regular updates and stock experience, pls reply. 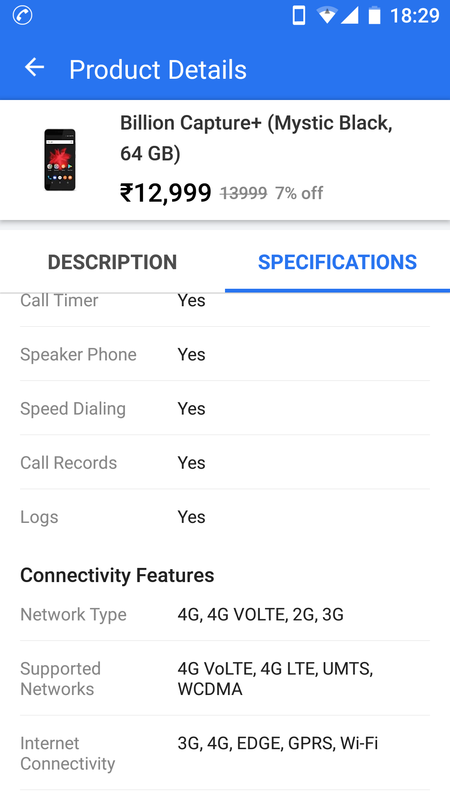 Capture plus out of stock. Wondering how a ENGINEERED in INDIA CAPTURE+ is provided with CALL RECORDS . Similar feature missing in SRT. It is call records, not call recording. Planning to gift capture+ to my sister. Flipkart billion phone has a service centre in Pondicherry (as listed in their site). Smartron service centre is in Chennai (nearest to me). If both the brand service centres merge, it'll be very helpful for customers like me who need not go to distant places for a small fix. Also in your marketing ads you can boast of even bigger customer care coverage. And a question by the way. 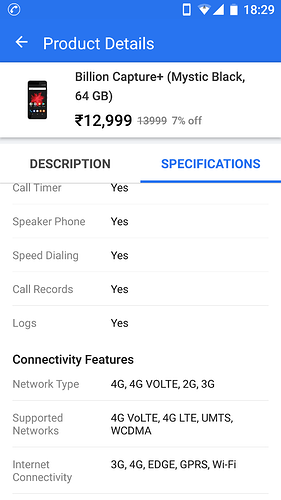 If it give my mobile for service in a local shop will my warranty (and extended warranty) get void? My phone is working flawlessly in terms of speed and performance. But I'm not able to hear my caller so had to turn on loudspeaker everytime, which is really frustrating. So i need a fix for it. I'm even ready to ship my phone to the service centre if such provision is available.. These are already mentioned in the specs . With this device powered by tronX, we are also working with Flipkart to continue to bring our AI based tronX Launcher to the Billion Capture+ as part of its technology roadmap. @RohitRathi But Billion Capture+ (Power by Smartron) not coming under Indian Law?